While there are many theories behind weight loss, the bottom line is that you must consume fewer calories than you burn to lose weight. 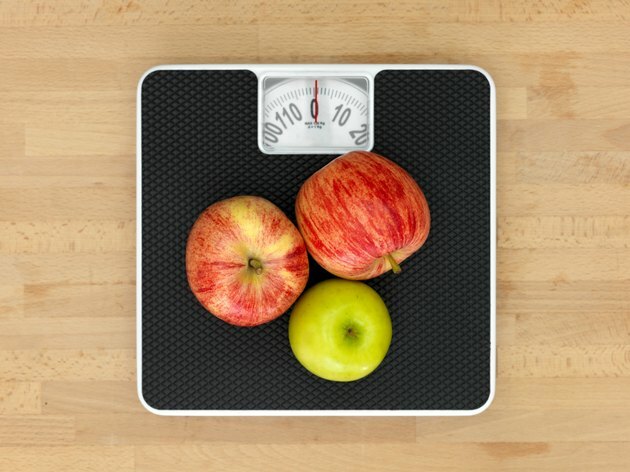 While the average diet has about 2,000 calories, this number can vary substantially based on your age, gender, weight, activity level and other factors. Therefore, to create a calorie deficit large enough to lose a substantial amount of body weight, you will first need a good idea of how many calories your body burns each day. According to the Centers for Disease Control and Prevention, it takes a 3,500-calorie deficit to lose a pound of body fat. Therefore, to lose 1 to 2 pounds per week, you will need to lower your caloric intake by between 500 and 1,000 calories per day. To estimate your current calorie intake, you can keep a food journal that documents the approximate number of calories you consume at each meal. While many individuals may be able to lose weight by consuming fewer than 2,000 calories a day, the amount of weight you can lose depends on how many calories your body burns. The U.S. Department of Agriculture's Center for Nutrition Policy and Promotion has estimated the average calorie requirements for individuals, based on age, gender and activity level. As an example, sedentary males between the ages of 26 and 30 use, on average, need 2,400 calories per day. Moderately active males in this age group use 2,600 calories per day, and active males use 3,000 calories each day. Sedentary females in the 26-to-30 age group use 1,800 calories per day, on average, while moderately active and active females use 2,000 and 2,400 calories, respectively. The Center for Nutrition Policy and Promotion notes that "sedentary" is defined as only light daily activity; "moderately active" is the equivalent to walking 1.5 to 3 miles per day at a 3- to 4-mile-per-hour pace; and "active" is defined as the equivalent to walking more than 3 miles per day at a 3- to 4-mile-per-hour pace. The Centers for Disease Control and Prevention recommends that all individuals engage in at least 2 hours and 30 minutes of moderate-intensity aerobic exercise each week, accompanied by at least two days of strength training that works all of the major muscle groups. In addition to lowering your caloric intake, it is important to consider the types of foods you eat. ChooseMyPlate.gov notes that there is a limit on how many empty calories you should consume each day. As an example, the limit for males ages 19 to 30 years is 330 empty calories, and limit for females between the ages of 19 and 30 is 260 empty calories. If you consume too many empty calories, you will use up your caloric allowance for the day without consuming an adequate amount of essential nutrients. Examples of empty calories include soft drinks, most baked goods, fried foods and processed snack foods. By limiting your consumption of these foods to one or two servings per day, you will have more room in your diet for fruits, vegetables, whole grains, lean meats, low-fat dairy, nuts, fish and healthy fats. If you fulfill your daily calorie requirement while still lacking vital nutrients, you can end up with health problems, many of which can manifest themselves as fatigue and tiredness during the day. That can, in turn, lower your energy output and the number of calories you burn, making it harder to lose weight. USDA ChooseMyPlate.gov: Calories: How Many Can I Have?